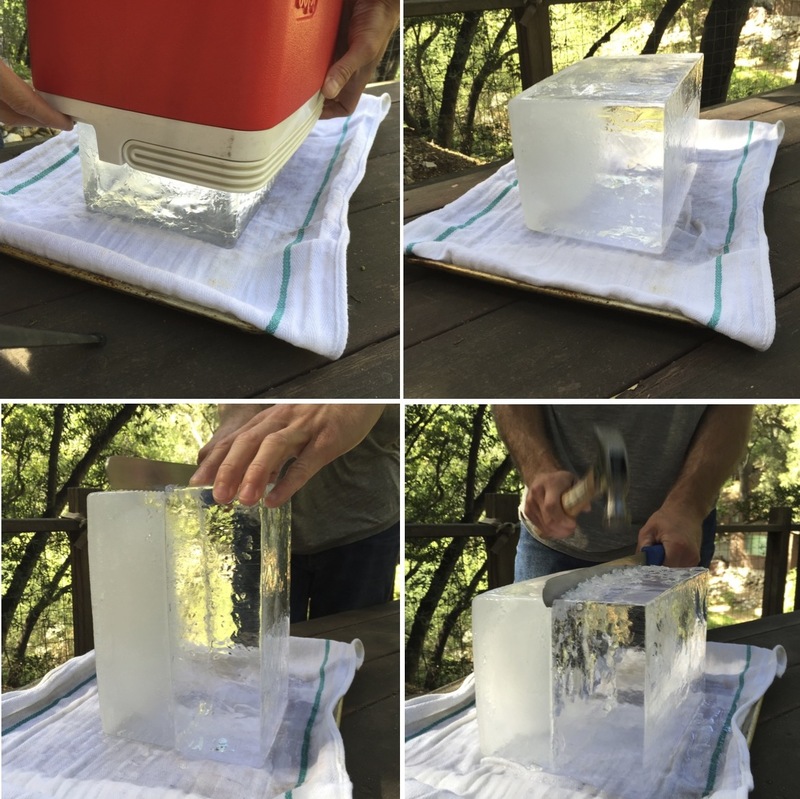 It’s easy to make cloudy ice. But clear ice is prettier. To learn what makes clear ice, let’s examine a pond. The earth insulates a pond on all sides but the top, so very cold air settling over a pond will freeze it from the top down. As the water freezes it releases little bubbles of air, and those bubbles are pressed down into the pond. They have a place to go. In your freezer, the little cubes in their tray aren’t insulated at all, and they freeze from all sides at the same time. Bubbles form, but–no place to go. All sides of the cube are frozen and the air bubbles are trapped in the center, making a cloud. 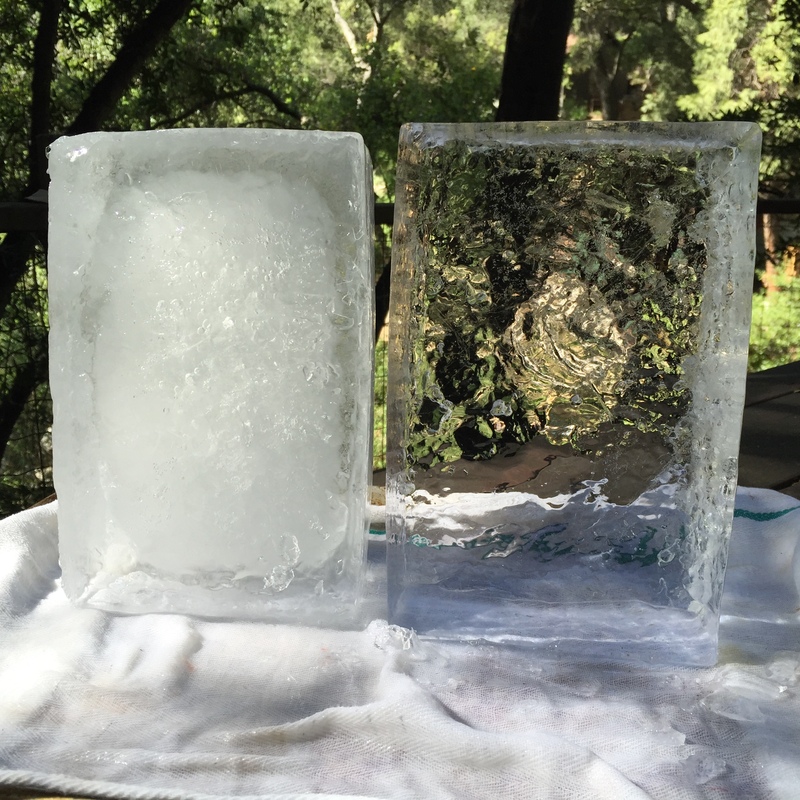 The following method for making clear ice in your freezer approximates the pond conditions, and insulates on all sides but the top. The result is a block that is half clear, half cloudy since all the bubbles will be pushed to the bottom of the cooler where they can’t escape. 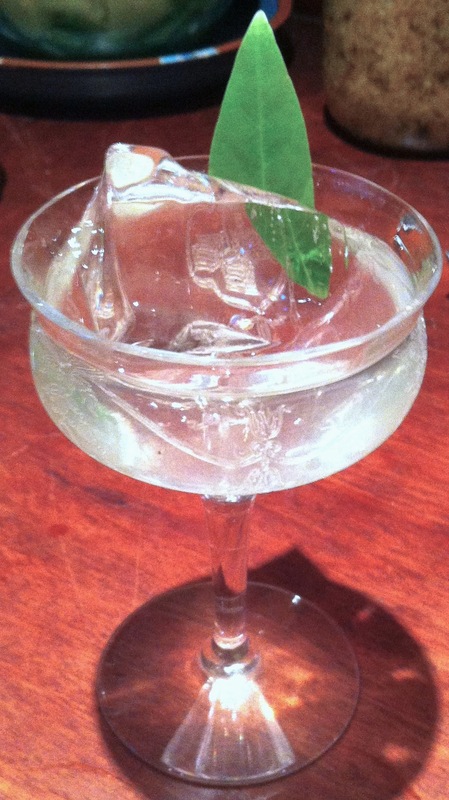 But it’s simple enough to carve the cloudy part away and make pieces of crystal clear ice with the rest. Fill cooler with water to within a few inches of the brim. Remove the lid of the cooler if possible; if not, prop it open. When the ice block in the cooler is solid, remove cooler from freezer and let sit at room temperature for a few hours with the lid off or open. This is called “tempering,” which prevents the ice from shattering when you cut it. Place kitchen towel on sheet pan. Turn out ice block from the cooler. Place it such that you’re looking down on the side of the block: you’ll see the plane where cloudy ice and clear ice meet. Score a shallow groove in the block by sawing firmly with the serrated knife along that plane. Flip the ice over 90 degrees, and score again. Repeat until a groove is scored around the circumference of the block. With the knife held against the groove, take your hammer and begin tapping firmly on the top of the knife. The block will shear in half along the scored groove producing two blocks: one cloudy, one clear. Use the cloudy block for less important cocktails or sore muscles. Continue as before, scoring the clear block and hammering the knife to produce blocks of your desired shape and size. 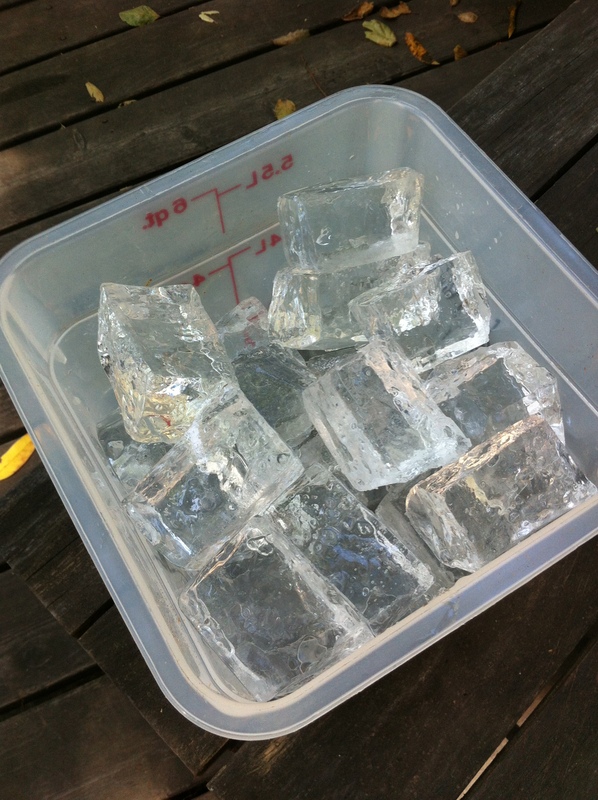 Store cut ice blocks in a freezer bag or lidded plastic container for later use.